Please check here for details of when the bar is open during the off-season. If you would like the bar opened, for example to watch football on Sky, please call Colin Warne on 07598 939903. Otherwise, the bar is next scheduled to be open for Cricket Force on Saturday 13th April and Sunday 14th for YP registration and coaching. Curry Nights normally take place on the last Friday of the month. Bar open from 6:00pm, food served around 7.30. Our Pavilion is available to hire for sports, business and social events. All types of parties and events can be accommodated. With a delightful rural view, yet within 15 miles of central London, our facilities offer a fine setting for that special occasion or special business conference. Jack Russell's painting of Cobden Hill is now on display in the Pavilion. There is also a line drawing identifying all of you who feature in the painting. A limited edition print of the painting has been produced - 100 copies, all numbered and signed by Jack. There is also a limited edition print of the line drawing - 25 copies, again numbered and signed by Jack. The cost of these unframed prints is £250 for the painting print, or £300 for both (prices are inclusive of VAT). 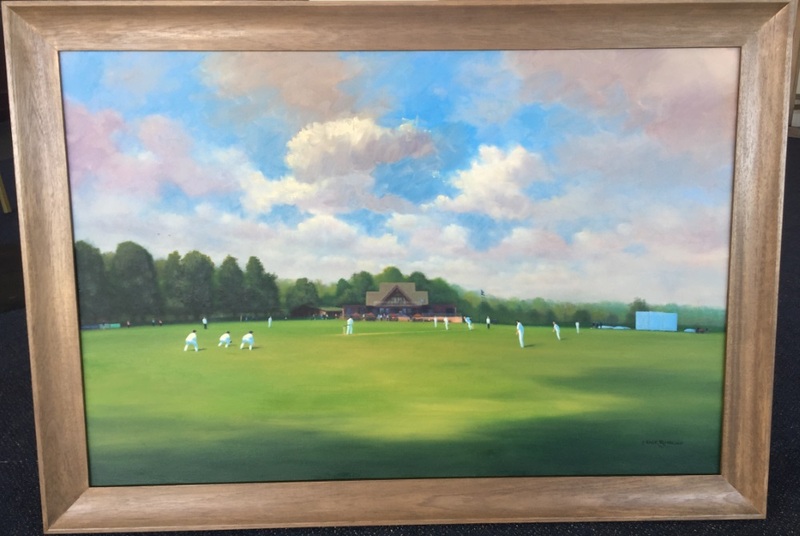 The prints can only be purchased through the Club by contacting Tony Johnson (email - tj@radlettcc.com phone 07770 966688). We are still looking for a sponsor to cover the cost of the original painting so if you are interested in offering support in this then please contact Tony. 3rd XI Radlett 2nd eleven Home 1.00 p.m.